Home Tags Posts tagged with "alberta wildfire"
More than 90% of buildings in the evacuated city of Fort McMurray have survived the massive wildfire, Alberta’s provincial premier Rachel Notley said on a visit. She said the hospital and most schools were intact but 2,400 out of 25,000 structures had been burnt. “It was a miracle we got the entire population out safely,” Rachel Notley told reporters. More than 80,000 people were evacuated from Fort McMurray last week. Nobody was killed in the fire but two people died in a car crash when they were leaving the city. Officials said they hoped to provide a schedule within two weeks for the return of residents. Alberta government declared a state of emergency and promised C$100 million ($77 million) in cash to evacuees whose homes have been gutted. According to officials, the battle to contain the wildfires reached a turning point on May 9 thanks to drizzle and favorable winds. Premier Rachel Notley visited Fort McMurray for a first look at the destruction caused by the massive fire. She said she was “very much struck” by the power it had to cause devastation. The wildfire covered 622 sq miles on May 8, Rachel Notley said, and was about 20-25 miles from the neighboring province, Saskatchewan. The gas in Fort McMurray has been turned off and the power grid is damaged, while the water is not drinkable. The team from the provincial government will begin preliminary planning on repairing damage in Fort McMurray. The Fort McMurray fire is growing further and could spill in to neighboring province of Saskatchewan, Canadian officials say. Hot, dry and windy conditions are hampering efforts by hundreds of firefighters to tackle the blaze. The blaze has already caused the evacuation of 80,000 people from the oil city of Fort McMurray, and thousands are still stuck to the north. Their evacuation, originally planned for May 7, will now take place on May 8. The wildfire now covers an area of more than 700 sq miles, which includes areas still ablaze and areas already burnt. It was being propelled by high winds to the north-east towards Saskatchewan. Smoke from the fire has already spread there, and air quality statements have been issued for both Saskatchewan and North-West Territory. 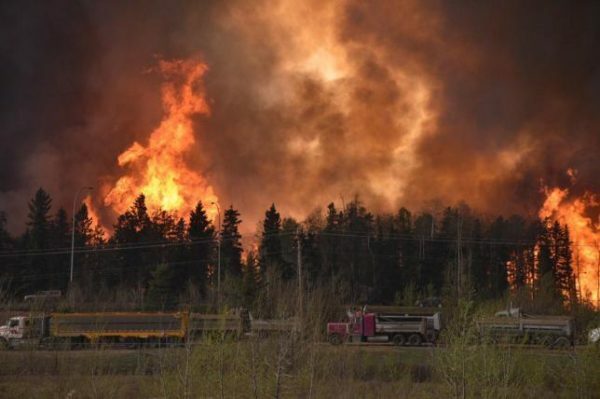 “Fire conditions remain extreme,” said the Alberta Emergency Management Agency on May 7. There is the possibility of rain on the next days, but officials say the fire can only be put out by sustained heavy rains. Earlier this week, most evacuees headed south but some fled north, sheltering in work camps beyond Fort McMurray. Thousands have since been shuttled out by road and air, with small convoys passing through the fire-ravaged city on May 7. The blaze has ruined entire neighborhoods, with residents warned it could be some time before they can return. Officials say the power grid is damaged and the water not drinkable. As much as a quarter of the country’s oil production has been halted by the fire, raising concerns about the effect on the Canadian economy. 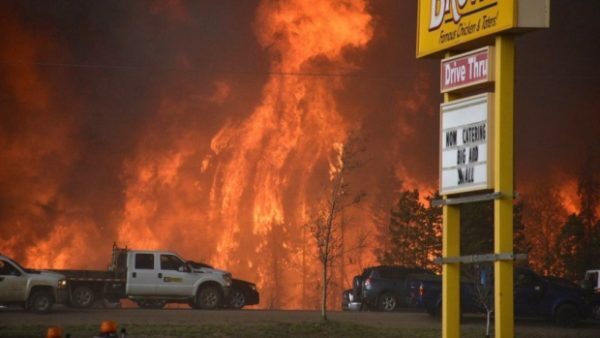 According to Canadian officials, the huge wildfire which devastated the oil town of Fort McMurray could double in size over the next 24 hours. The fire now covers an area larger than New York City and is being fanned by winds and feeding on dry vegetation. The flames are moving away from Fort McMurray, most of whose inhabitants have reached safety. Many are still stuck north of Fort McMurray and evacuations by road and air are resuming. More than 80,000 people were evacuated from the city earlier this week. Thousands of people have been airlifted out but a mass convoy evacuating people from oil worker camps in the north was halted on May 6 as huge flames flanked the road. At least 2,500 made it through the flame-damaged city and small convoys resumed early on Saturday. Another 4,000 people are also due to be flown out. There is growing concern over the air quality for those still north, CBC reported. The provincial government said on May 6 that the fire had grown to 386 sq miles. Wildfire prevention manager Chad Morrison said there was a “high potential that the fire could double in size” by the end of Saturday, May 7. However, he added that it would expand into a more remote forested area north-east of Fort McMurray. Dry conditions and 27C heat were expected during the day, but cooler temperatures would prevail and there was a possibility of rain on May 8 and 9. No deaths or injuries have been reported. Alberta provincial government has declared a state of emergency and will provide C$100 million ($77 million) in cash to evacuees. According to the Canadian government, more than 1,000 fire fighters and 150 helicopters, 295 pieces of heavy equipment and 27 aircraft tankers have been deployed. Despite the evacuation order, the Royal Canadian Mounted Police (RCMP) said they found an elderly man and a family of five in Fort McMurray. They were led to safety. Some 8,000 people who fled north of Fort McMurray have been airlifted by authorities as blaze engulfed the Canadian city. 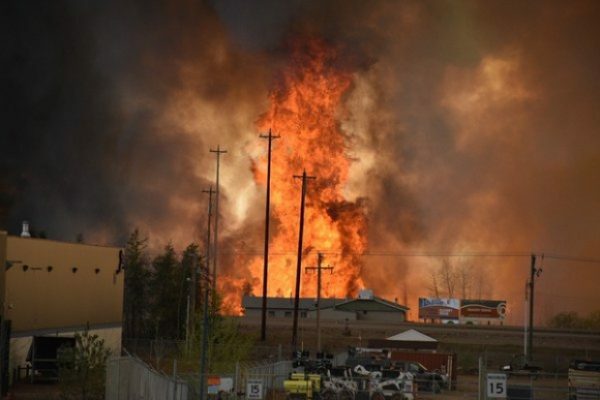 Fort McMurray has been devastated by a massive wildfire. Officials also hope that the only highway to the south will become safe on May 6 to move the remaining 17,000 people, who are in danger of becoming trapped. The entire city of Fort McMurray – more than 88,000 people – was evacuated three days ago. Most fled south but some went north. The fire in the province of Alberta has grown to 328.2 sq miles. Hundreds of firefighters are battling the blaze using helicopters and air tankers. The fire, which covers an area almost the size of Calgary, Alberta’s largest city, has slowed down and is now heading away from Fort McMurray. Alberta Premier Rachel Notley warned city residents that they were facing a long wait before they would be able to return home. The blaze has already destroyed more than 1,600 homes and other buildings in Fort McMurray. A rare province-wide fire ban has been declared to try to reduce risk of further blazes. Most of those who fled north have been staying in oil sands work camps in the remote area. About 4,000 of them have already been flown in military and civilian transport planes to Edmonton and Calgary and another 4,000 are expected to be rescued within hours. The authorities hope that Highway 63, passing through Fort McMurray, will be safe on May 6 to move the rest. A helicopter is expected to lead that evacuation convoy. The evacuees are being moved again because urban areas in the south are better able to support the displaced, officials say. “Our focus right now is on getting those people south as quickly as possible,” Rachel Notley said. The fire is growing in size due to high winds but it is “under control”, officials say. It started on May 1 in Canada’s oil sands region and many oil sands projects have cut production. Some people were forced to flee twice: first to temporary refuges south of Fort McMurray then again as the flames grew. The government is working on finding temporary housing for families who lost their homes and belongings in the blaze. There are still no known casualties from the fire but there was at least one vehicle crash with fatalities on the evacuation route. Scott Long of the Alberta Emergency Management Agency called the blaze “an extreme fire event” and said that rain would be needed to fight it. Cooler temperatures and rain are forecast, giving hope that it could become easier to contain the fire. Canadian government has declared state of emergency in the province of Alberta after a wildfire forced all 88,000 residents of Fort McMurray to flee. According to officials, the fast-moving blaze could destroy much of the city. The blaze, which broke out on May 1 in the heart on the country’s oil sands region, has gutted 1,600 buildings, including a new school. The evacuation was largest-ever in Alberta. Oil companies operating in the area have been forced to cut output. Several companies have shut down some pipelines. This was done to help evacuate non-essential personnel, reports say. So far there have been no reports of deaths or injuries in the wildfire, but two women gave birth in one evacuation centre, Reuters reported. Bernie Schmitte, an official at Alberta’s agriculture ministry, said on May 4 that the “catastrophic fire” had so far “resisted all suppression methods”. After flying over the burning city, Alberta Premier Rachel Notley said the blaze had moved north and east across Fort McMurray. First Nation communities 30 miles south of Fort McMurray were given mandatory evacuation orders on May 4. Unseasonably high temperatures and strong winds have combined with dry conditions to leave much of Alberta and neighboring Saskatchewan under an extreme fire risk warning. Canadian PM Justin Trudeau said he would send military aircraft to help if they were needed.